The High Museum of Art is a beautiful, modern space and cultural center in the heart of Midtown Atlanta. The Museum's educational and design team connected to my Service Design graduate team at Georgia Tech, in order to collaborate and work towards a design solution that could improve guest experiences, attract new guests and ultimately build a flourishing member base to support the museum. 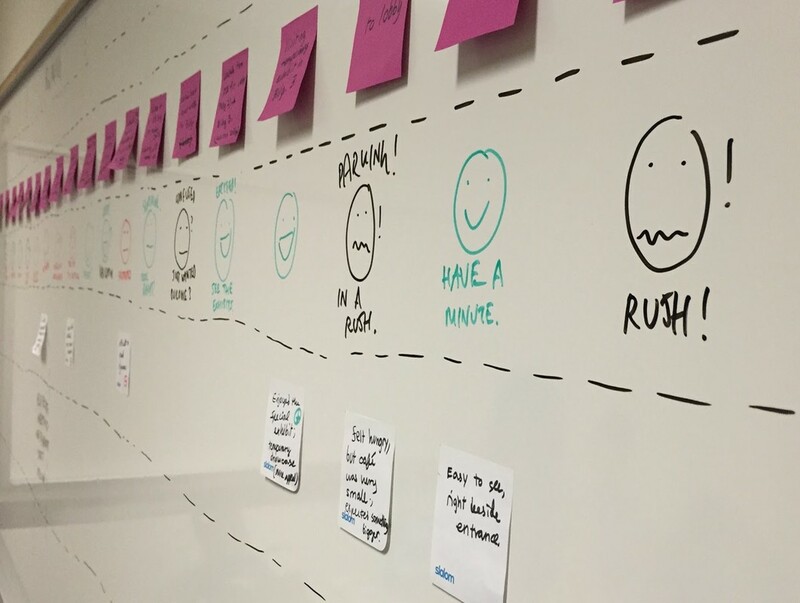 Over four months, my team and I worked closely with individuals at the High Museum to map out the stakeholder ecosystem in the museum, research guest pain points and opportunities for improving experiences, and prototype and evaluate an improved touchpoint in the guest experience. Along the way, we worked to integrate the spirit, values and high-level goals of the Museum into our design efforts. Our regular meetings with the core museum team - designers, educational professionals and other staff, were integral to building rapport and open communication throughout the project. From the start, we listened to the museum team as they told us their goals, their pain points and areas for design opportunity. We took this information through the lens of our own observations, comparisons and research while visiting the museum and talking to visitors. Specifically, I planned questions to ask our museum team, informal research guides for museum observation and interviews, and synthesized the team's findings in our discovery work for pain points to address. 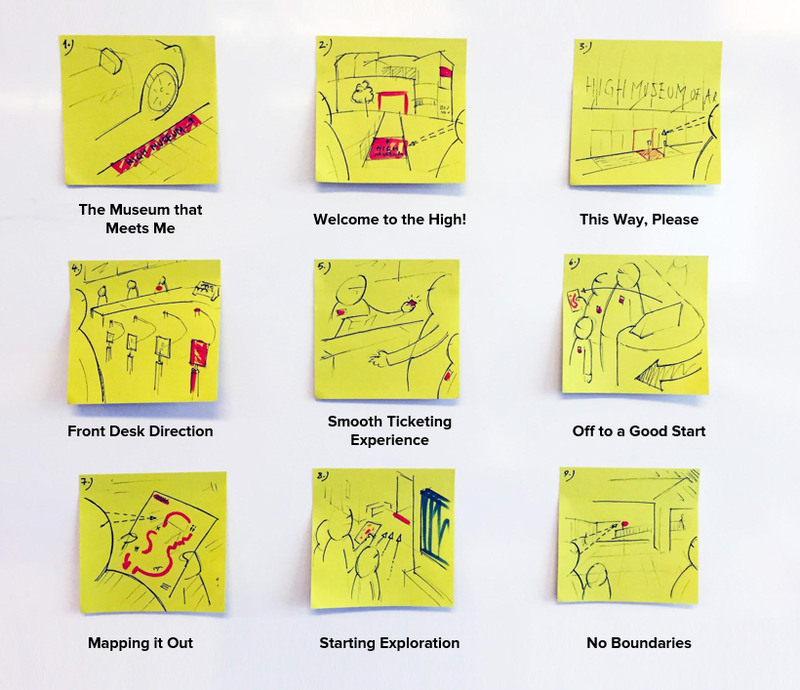 Through a thorough journey mapping session of a guest's experience before, during and after visiting the High, my team and I honed in on a few areas of opportunity - for example, providing a better sense of direction between exhibits, or giving guests more insight into what types of exhibits they should see before they even set foot inside. 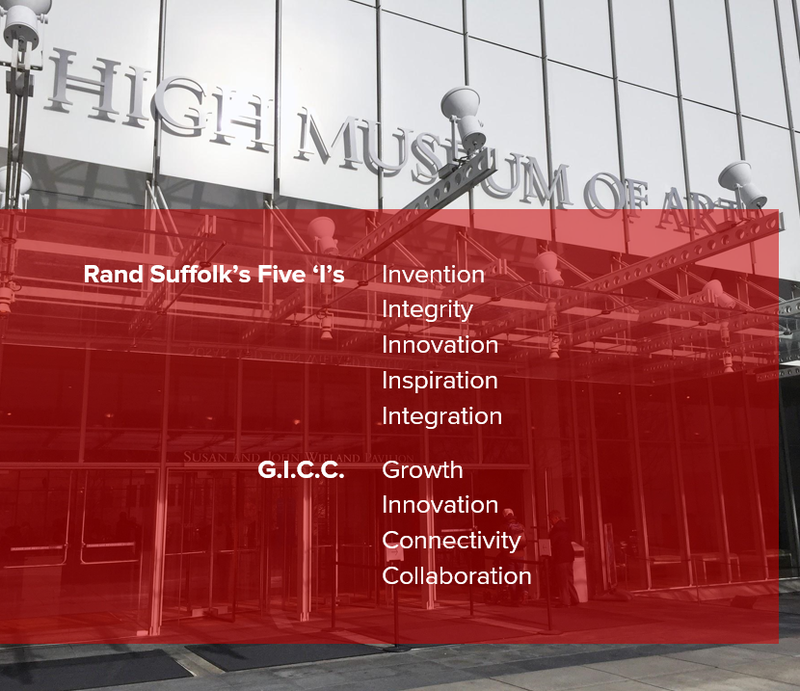 Rand Suffolk, the Director of the High Museum has a framework for values that build the museum. After a museum staff member highlighted these values for us, we strove to keep them in mind during the design process. 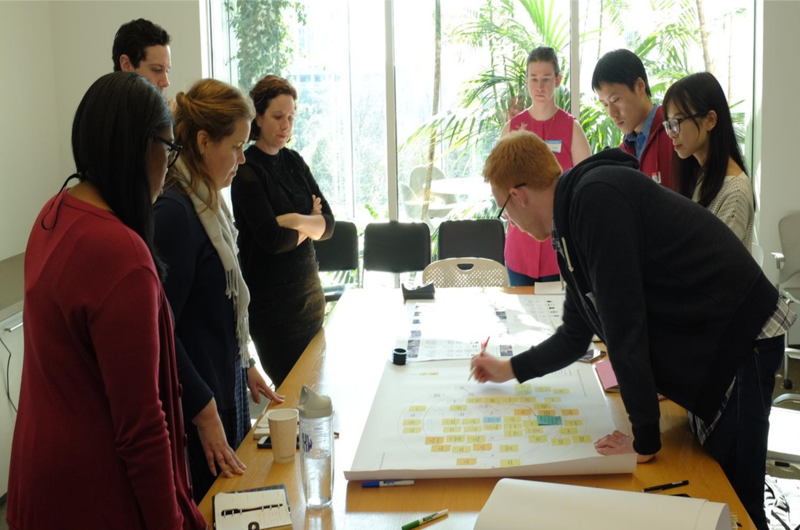 In design feature ideation and prioritization sessions, I organized meeting agendas and co-led brainstorming activities and idea synthesis sessions, engaging my teammates in a collaborative process and presenting thoughtful work and questions to our partners at the High. ​With revised input from the museum team and our own insights, we centered on improving the museum experience for first-time visitors through the lens of wayfinding. I worked with a visual designer on our team to create a series of 'next generation' future components of the first-time visitor experience, all encoded with superior wayfinding. After discussion with the High, my team focused on a subset of these experiences to design, prototype and evaluate in the museum environment. Over several weeks, my team and I drafted new queue concepts to help people understand the multi-line system for tickets in the main High Museum lobby, as well as guide them organically to exhibits in this building through space design. This video showcases our prototyped queueing system design, New Queue, in action in the Museum. After testing New Queue and making slight modifications throughout the day, we received positive feedback from museum staff who witnessed the lines and observed that guests seemed to have an easier time finding the proper line and seamlessly travelling from the ticket counter to the art exhibits. For future work, it would be beneficial to integrate this wayfinding experience in the various diverse spaces that make up the High, and get more detailed feedback from guests who have experienced the old and new queue systems. Although the initial entry into the museum lobby to buy tickets is so critical, wayfinding is essential to the entire guest experience, and it would be enlightening to better understand other opportunities for improved wayfinding and guest navigation throughout the museum experience.